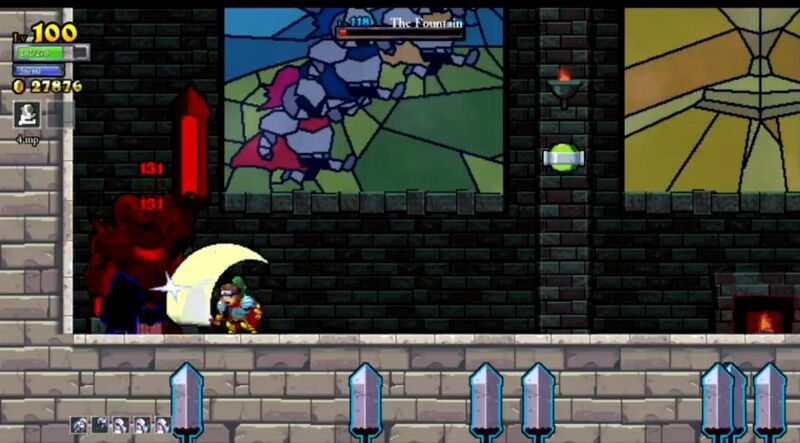 The Shinobi is a class that newcomers to Rogue Legacy generally hold in very high esteem, and it's easy to see why. They move 30% faster than all of the other jobs in this game, and they deal immense damage right out of the gate. The Shinobi base attack value is 75% higher than the default Paladin, which means that all of the early game critters in the dungeon will be expiring in a single swing of your sword. 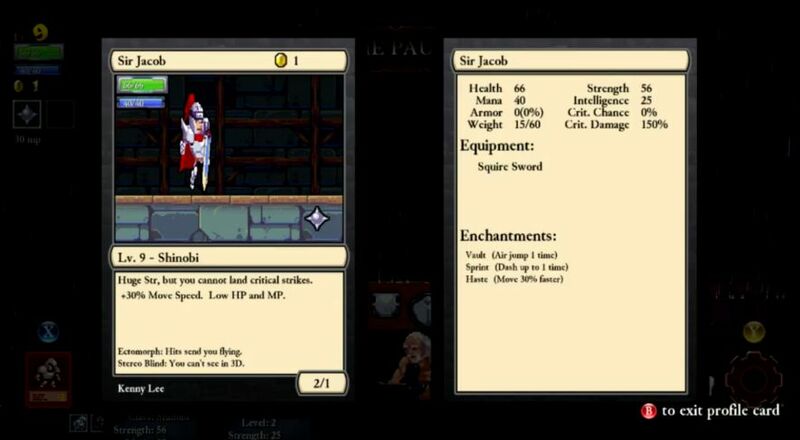 To put some numbers in there as an example, Sir Lee the default starting Knight will inflict 25 damage per hit. A Shinobi will dish out 44 damage on each attack instead - that's a lot more! If you believe that a strong offense is the best defense, this is the class for you. When the Shinobi is upgraded to the Hokage (note: this is pronounced like "hoe-kah-gay" per Japanese and not the way it looks in English), the class also adds a useful defensive ability in the form of the replacement technique. This is another Naruto reference (officially the kawarimi technique), a move where the ninja will disappear in a puff of smoke and leaves behind a log in their place. Why a log? I have no idea, this is Japanese pop culture we're talking about here. 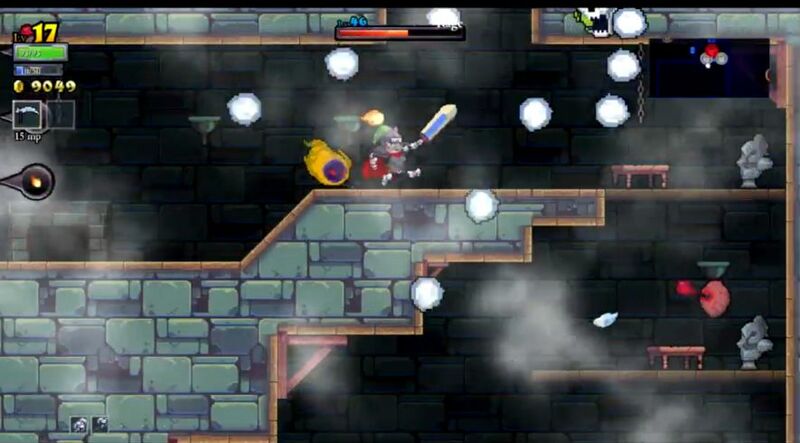 For Rogue Legacy purposes, the replacement technique allows your Shinobi to blink forwards in the direction he or she is facing a short distance, passing through anything along the way without taking damage. It's kind of similar to the air dash granted by runes, and it travels about the same distance horizontally, but of course the Shinobi can't be damaged by anything midflight, and the replacement blink technique is also instantaneous. While it does take a little practice to use, the replacement technique can get you out of some hairy situations, and it looks incredibly slick when you use it to dodge an enemy attack. This is a nice extra ability that fits well with the class theme. There are some major drawbacks to the Shinobi class, naturally. The biggest one is the low lifebars on these characters. Their 60% health is well below average, and the fragile nature of the Shinobi will be one of the inescapable realities of this challenge. It's very common to be racing through part of the dungeon, kicking asses and taking names, only to have your ninja suffer two or three hits and suddenly wind up dead. There's a thin line between success and failure with these walking glass cannons. Another major negative is the tiny mana pool on the Shinobi, only 40% of the base value. That's even lower than the Barbarian and Miner classes! As a result, even though there is no penalty to magic damage on this class, Shinobis simply don't have enough mana to make investing in the Intelligence stat worthwhile. You run out of MP too fast. Better to concentrate on the key stats of Health, Attack, and Armor instead. Finally, the inability to critically strike with the Shinobi doesn't matter at all in the beginning of the game, but it becomes a larger and larger handicap over time. By the time that the upgrade tree has been completely maxed out, Shinobis will eventually be left far behind the other classes due to their lack of crits. This is why most people view the Shinobi as an inferior version of the Assassin class, and I have to agree with that consensus. The Mist Form on the Assassin is a more useful ability, and the crit damage on that class becomes stupidly high after 200 or 300 levels worth of stats. Nonetheless, the Shinobi is a fun class in its own right, and it should present some unique gameplay of its own. Just by way of comparison to the last Legacy series, this is a class that has slightly more health than the Miner... and more than TRIPLE the physical damage! Ha! The Shinobi is not one of the game's four starting classes, so it was up to Sir Lee to amass enough gold to unlock it. Going back into the Normal castle is always such a drastic drop in difficulty, balanced somewhat by losing all vampirism and having no double jump or dash on this first playthrough. The biggest issue on this particular playthrough was the frequent occurrence of rooms with vertical pits in them. I hate that room layout, since you're forced to jump down into the bottom of those shafts to fight the monsters at the bottom if you don't have a ranged spell that can pass through walls. Sir Lee always has the dagger spell, and that was totally useless here. This same room layout appeared three times in the castle, and although I cleared it the first two times without issue, the third one had zombies popping up unexpectedly from the floor. Surprise! I took two hits at 35 damage each, and Sir Lee was down to 30 HP just like that. I ate the chickens at the teleporters for 10 health apiece, and still managed to get a full clear of the castle. Next I did manage to find the boss door in the forest, but one particularly packed room caused me to take multiple hits. The lack of a double jump killed my character a couple of rooms later, as I was unable to avoid a wolf underneath my character. Ah well, not a bad initial run. The gold total was just short of 3000, enough to unlock over to the Shinobi class. It required seven total levels: Smithy, Health Up, Upgrade Knight, Equip Up, Architect, Upgrade Barbarian, and then finally the Unlock Shinobi upgrade. Despite the long list these are all cheap levels to get, and all of them together only cost a little over a thousand gold. This left 1700 cash to unlock the Enchantress and pick up the two basic runes (double jump and dash) along with the very cheap Squire Sword. I also picked up the useless Haggle, since it would lead to the Upgrade Shinobi level and the class upgrade. Not enough money for that on this run, hopefully after the next one. Ectomorph and Stereo Blind, with the conflux spell. This was the first Shinobi of the run, and he immediately highlighted the strengths and weaknesses of the class. The class has immense damage potential, with physical damage going from 25 on Sir Lee to 56 on this character. More than doubled damage! (With the bonus from equipping the Squire Sword.) Almost everything in the castle portion of the dungeon died in a single hit. The extra movement speed was also quite nice. Unfortunately, the tradeoff was total glass cannon status. My ninja had only 66 life (it's a base value of 60 HP with one mandatory extra level from the Health Up point needed to get over to the Shinobi), and that was a sizable downgrade from Sir Lee's 100 health. Chickens provided only 6 HP per meal. As sad as this might sound, it was still a massive step up from the Miner class that I had done previously, which had even less health without the incredible damage to compensate. This Shinobi was able to pick up my first rune of the run (unfortunately a Grace Rune, blah) and make it through the castle with only two hits taken. Well that sounds good and all, but those two hits left my Shinobi at 26 / 66 HP and a step away from death. Not much room for error. I ate the chickens that I'd found and ventured onwards. This character died in a "kill all monsters" fairy chest room, but not in the way you would think. I'd defeated all but a single plinky enemy, and as I was going for that last hit a random bouncing spiked ball dropped down onto my head for the last blow. That was a real pain, I might have found a useful rune in there! Anyway, with the gold from this run I picked up the Hokage upgrade for the Shinobi class, unlocked over to the Gold Gain upgrade (while not having enough for the first level there), and bought the Knight Helm and Chestplate from the Blacksmith. I'll keep referring to the characters as Shinobis rather than Hokages for simplicity's sake, even though all future heirs have the class upgrade. Alektorophobia and the conflux again. As the first Hokage character, this Shinobi had the replacement technique activated, allowing me to dodge to the left or the right and leave a little log behind. I'd be saving mana for this ability and not the terrible conflux spell. This Shinobi also had a major increase in health, from 66 HP up to 87 HP, with the Knight Helm providing most of the difference there. Generally speaking, health is the most important stat to upgrade early in the game, since it allows you to survive longer and get further into the dungeon, creating a positive feedback loop. 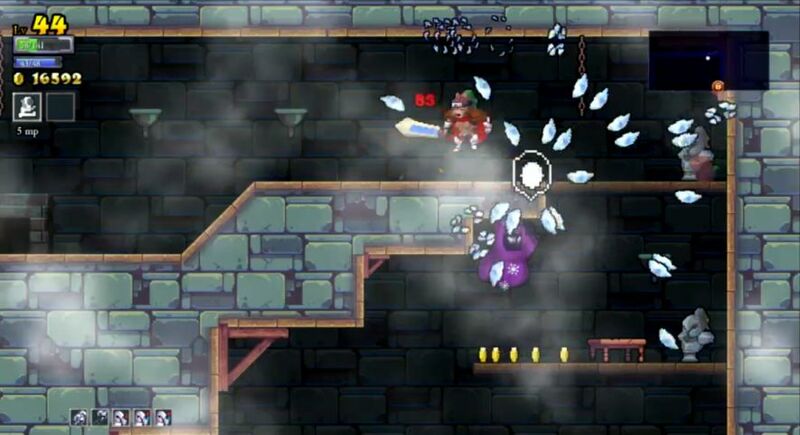 The coolest thing on this particular run was using the replacement technique to disappear through a fire shooting trap and grab a treasure chest on the other side. I slowed down the footage and grabbed the picture above to demonstrate the distance that the Shinobi teleports when using this class-specific ability. While it does take some practice to use, it's pretty awesome in a lot of situations. Blink your way out of danger! I actually should have used it more often than I did, since I failed an easy fairy chest challenge that I could have picked up by using the replacement technique. Anyway, this character cleared the castle without too much trouble (also taking two hits over the whole process) and made it through more than half of the forest. Another "defeat all monsters" fairy chest was my downfall again, my effort to kill everything proving this character's demise. There was enough gold to claim two Gold Gain upgrades (woohoo!) and a single point in Health and Attack. Hypergonadism and the scythe spell. I had my choice between a Shinobi with no knockback (Muscle Weakness) and this one with the super knockback (Hypergonadism) and opted for this one. By now clearing the castle was becoming fairly routine, although once again I did take a couple of hits in there. Some Vampire Runes (or even a Balance Rune like my Miners had used early on) would make this vastly easier. Some way to get health back makes the game so much simpler. Eventually I came across a fountain and that solved the problem of health loss for the moment. I did find Botis in the castle and managed to defeat him without taking a hit, which was a good thing because I'm pretty sure any hit would have killed this Shinobi. The prize was a Mana upgrade, which was sadly not that great for this class. (I would later win the dagger-throwing carnival game, and the prize that time was a Magic Damage bonus. Even less useful!) I had the most success in the forest to date with this character, finding tons of chickens I didn't need and clearing room after room. I think I only took a single hit in the entire forest, a shield knight knocking me backwards into spikes in a careless moment. I managed to get several runes as well, using the replacement technique to dodge obstacles and get to the green chest in two different places. Love that blink ability. With the forest cleared, it was up into the tower next, where the monsters would all kill my character in two hits. I used the remaining recovery items when I took damage, but eventually they ran out and there was still quite a bit of the tower left to go. There was one crowded room with projectiles all over the place where I somehow managed to dodge shot after shot that would have killed me, including using the ninja blink at one point, and don't ask me how I made it through that one because I don't know either. Eventually I was cornered by a pair of eyeballs and a corrupt vanguard with nowhere to go. They finished off the excellent run of this fine Shinobi. The 10k gold wasn't quite enough to get two Gold Gain upgrades, so I picked up one point there, the first two Potion upgrades, and a pair of Health levels to boot. (The Upgrade Knave point is a prerequisite for Potion Up.) These first four runs were done together in one streaming session, and can be watched here by the curious. Savant and Dementia, with the chakram spell. This was a run that seemed to feature lousy treasure drops throughout its course. I was able to clear the entire castle without taking any damage, putting this Shinobi in good position to make deeper progress into the dungeon. The dagger throwing minigame showed up in the castle as well, which I managed to win in exchange for... the Blood Helm. Not so great. The forest had a repeat of the carnival game, this time with axes instead of daggers, and I won that again for the prize of the Silver Helm. Well that was a little better, although probably not enough better than the Knight Helm to be worth purchasing. 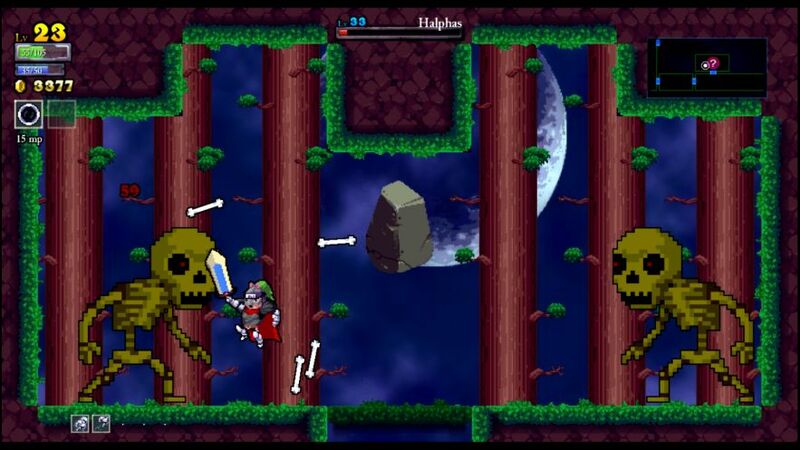 There was also a battle against the dual skeleton minibosses in the forest, who managed to hit me one time. (I thought that I dodged that bone projectile! It did 50 damage, half my health bar.) Their reward was yet another piece of equipment, this time the Blood Limbs. OK enough with the crummy Blood stuff! At least I was clearing the junk out so it couldn't continue to drop. I made it through the entire forest on two hits: one against the skeleton minibosses, one against a bouncing spiked ball which hit me the instant I dropped into a room. Super cheapness there. The last room in the forest then had one of those layouts packed with monsters, about ten of them in a sardine can, and cutting through them dropped my health down under 20 HP. 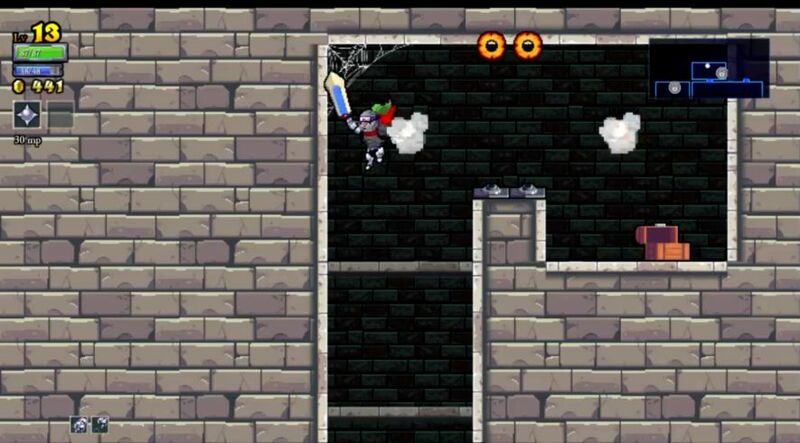 This did not bode well for a deep tower run, and indeed this ninja fell very quickly up there to a demon painting. Ah well. I used most of the loot from the run to get the fourth Gold Gain upgrade, and decided to use the Balance Rune that I'd found on this run as well. It had worked for my Miners on the last series while waiting for Vampire runes to appear. There was just enough left over for an Armor level after that, not enough for more health. 12 gold left at the end. PAD trait (yay!) and Endomorph along with the scythe spell. I kept dodging the floor spikes at the start of this run before remembering that they wouldn't trigger due to PAD trait. Having even the minimal sustain from the one Balance Rune (1 health and 1 mana per monster kill) was a big help when I would inevitably get hit and take damage. This was honestly a lot more sloppy than some of the previous runs, I was leaning heavily on that sustain to overcome some of the mistakes that I made in the castle. The biggest of those errors was going for a "No Fighting" fairy chest, which turned out to have a Retaliation Rune inside. Although I did get the prize, I took three hits from the ball and chain monsters that filled the room, dropping my character all the way down to 10 health. Umm, that probably wasn't the best decision there. 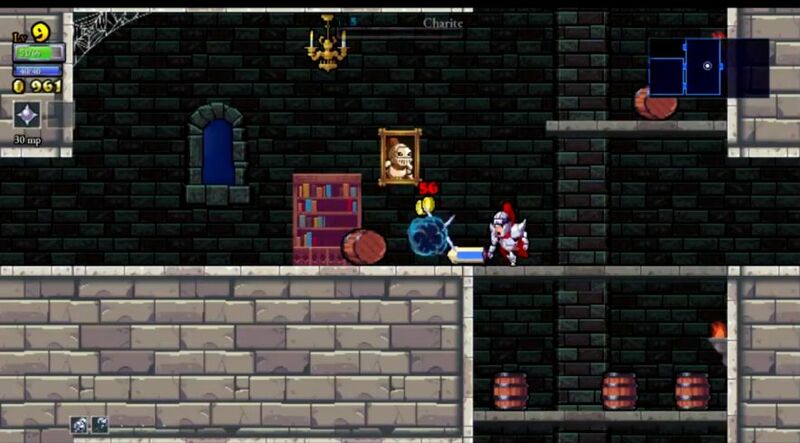 Fortunately I found the castle boss room shortly thereafter and picked up a chicken to dodge out of one-hit kill status. The big highlight of the run was finding a Vampire Rune in the next fairy chest. It was a tough battle to get it too, the room in which it was located nearly caused the death of this fellow. 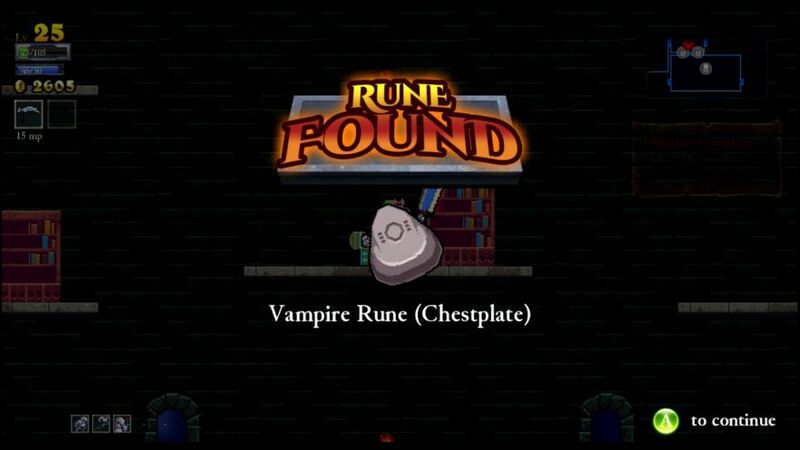 I'd like to think that getting the earlier rune was the reason why this chest had a Vampire one inside. Anyway, the run after that point was pretty unremarkable. I collected another 2500 gold in the forest, while making too many mistakes along the way. An earth mage got the final blow when I didn't dodge his pillar attack correctly. D'oh. There wasn't nearly enough gold for the final Gold Gain upgrade, so I took a level in Potion Up instead and unlocked that Vampire Rune. Coprolalia and Endomorph along with the chakram spell. This ninja had no more health than before (still sitting on 105 max HP), but he had the huge advantage of that new Vampire Rune. +3 health per monster kill meant that hits taken could be erased over time without much fuss. There was an immediate example of this right away in the castle, where I took two unnecessary hits in a fairy chest room (which had a Curse Rune inside, ugh). I lost 45 health, and that would have doomed many of the previous runs. No problem this time though, as three rooms later I was right back to full again. 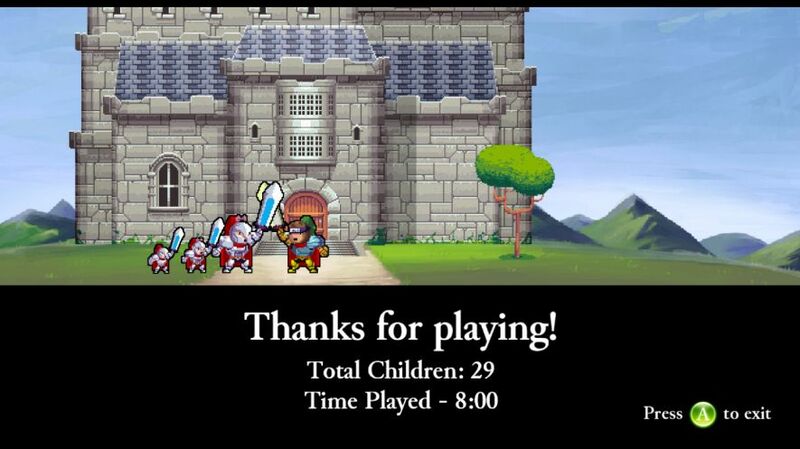 Having sustain makes such a huge difference in Rogue Legacy, it's like dropping the difficulty by a couple of points. From Emperor to Prince in Civilization terms, something like that. Because of the new lifesteal, I began by heading into the tower in the hopes of clearing it out alongside the easier castle and forest areas. This worked out in practice exactly the way that I'd hoped it would. My Shinobi had to retreat back into the low challenge areas after each hit, since monsters in the tower did about 50 damage and two hits had a good chance of killing my character. There wasn't a lot of room for error here! But so long as I took only one hit at a time, the tower could be cleared out with great care. I think that I had to make three retreats total. Still, after about 30 minutes of real world time it was all done. The Shinobi's damage had been excellent throughout, I had a single point in physical attack and this guy was killing the enemies up there in three hits. Very nice. There were also a few pieces of Ranger equipment found along the way, the Helmet and the Chestplate. I would pick up both of them after the run was completed. There was still most of the forest to go at this point, which was handled without too much in the way of issues. I killed Botis along the way (for the useless Sage Helm, heh) and found a couple more runes, although nothing too significant. Eventually the forest too was cleared, and I had nothing left to do but enter the basement. The forest actually had an entrance directly into the basement from the bottom up, one of the weirdest things I've ever seen interms of dungeon layout. Yes, part of the forest was actually underneath the basement - bizarre. I didn't make it very far in the basement, as one hit did 65 damage and then a second hit killed me. Great run though, bringing home 23k worth of bacon. I turned this into the final Gold Gain upgrade, the fourth Potion upgrade, unlocks for the two new Ranger gear and the equipment weight to wear them, and then a handful of Attack upgrades. Ectomorph and the blade wall spell. This Shinobi was up to 129 health and was sporting the beanpole look from the Ectomorph trait (it makes you get knocked back further when you take a hit). 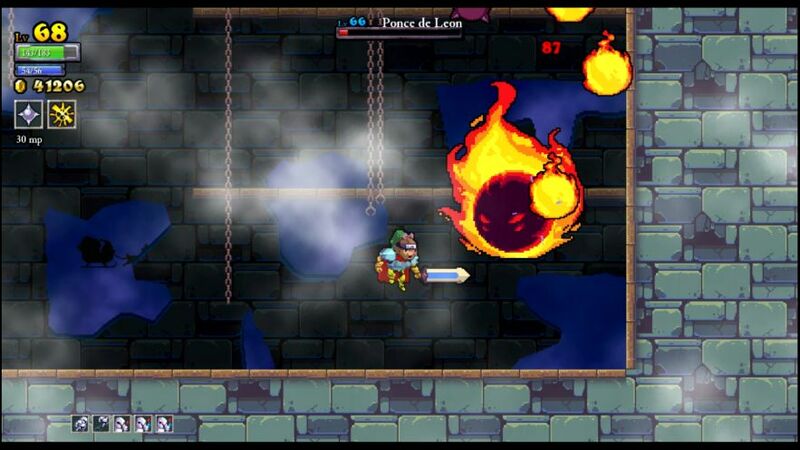 The start to this run was not good, as I flubbed my way throughout the castle. It was a good thing that I had so many areas to recover health via vampirism, this guy certainly needed it. That may have been caused by listening to the radio in the background, I've made that mistake before on previous runs. I tried to go straight into the tower again, only the entryway into the tower was a vertical room with plants raining down their shots from above along with ice mages in tight quarters. I took two hits right away and almost died! In any case, once I was able to get into the tower (past that first room!) things picked up considerably, and this run settled into a nice groove. One of the odd things about this particular dungeon layout was a lot of rooms with fairy chests on time limits, where your character has to reach them within 5 seconds or the chest closes forever. I picked up three such chests over the course of the run, picking up two Balance Runes in the process. I've been warming up to them lately, even if they aren't as good as Vampire Runes. Hard to argue with +1 health per monster kill, it's still more useful than faster running speed or excessive triple/quadruple jumps. Anyway, this Shinobi had little trouble clearing all of the tower, and then the forest. 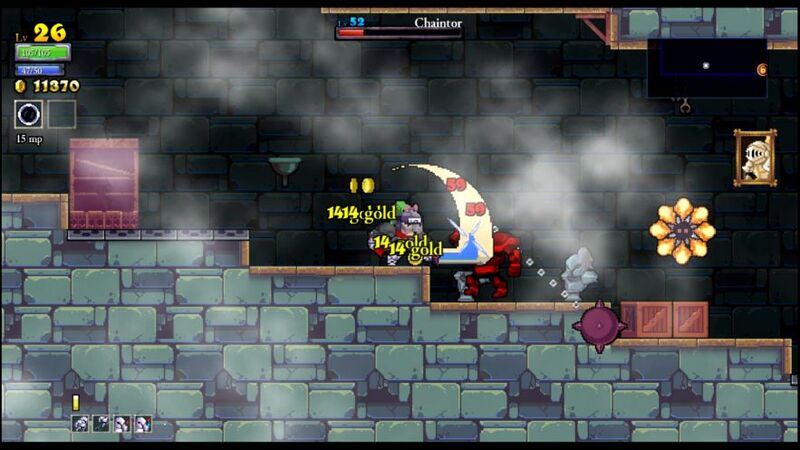 (I'd cleared the castle first, needing it to recover health from my initial blunders and dangerous tower entrance.) I had found more Sage gear along the way, sadly that was all the minibosses seemed to be dropping at the moment. That left the basement remaining with all of the teleporter chickens saved, and I was optimistic about maybe getting a full dungeon clear. Unfortunately the first room of the basement took a cheap shot at me, dropping my character immediately onto a plant monster with two ice mages in close vicinity, and I took two hits for 100+ damage wiping out those threats. There went all the saved recovery items. I did have good success in the basement and cleared out a little more than half, however the full dungeon completion was not to be on this run. Another one of those cramped rooms with fire raining down from the ceiling was this character's demise. The resulting 22k gold mostly went to finishing up with some of the utility upgrades. I took the last level in Potion Up, then went through the Spell Thief prerequisite points to drop three more levels into Invuln Time Up. That's a critically important upgrade for a frail melee fighter like the Shinobi. At that point, I had an unused rune slot and went ahead and bought another Balance Rune for it. Might as well, right? Two Health upgrades ate up the remaining money with 33 gold left over. Tunnel Vision, Dementia, and the Quantum Teleporter spell. This spell has the interesting property of putting down a shadow clone on the ground, and then you can warp to that location from anywhere in the same room. (It goes away if you leave the room.) I'm not sure if this is worth giving up a ranged weapon, but it's a bit of a different option at the very least. This was another dungeon that had a tough entryway at the start of the tower, horizontal fire at the top of the screen making it impossible to jump. There were more tough rooms behind it as well, the first three rooms in the tower were all tough slogs. I had to retreat out of there to get some more health. Had to leave more than once, in fact. This run cleared out the full castle and was progressing nicely through the tower (using the forest as a new restocking zone for HP) when I ran into a tier three ice mage. I misplayed the situation very badly and took two hits from the ice mage... and each of the two hits did 83 damage, killing me instantly. Whoops. I had gotten myself trapped against the right wall both times, and even the replacement technique wasn't enough to save my ninja. (Should have put down a shadow clone earlier!) The sad thing was the fact that I hadn't used a single saved chicken to date, not that it would have helped me very much here. Just not enough life to survive two hits in rapid succession. I used the money to finish off the last two Invuln Time upgrades, and that cleaned out the funds for everything but a couple minor health levels. Vertigo and Hypergonadism. This poor sap ended up rolling Vertigo, the worst trait in the game, which flips the screen upside down and backwards. Normally this results in a swift and sudden death, although I did my best to take this particular ninja as far as he could go. I made it through essentially the whole castle, and even figured out a few minor little tidbits about the Vertigo trait. It flips your character's icon on the minimap upside down, and it does the same thing to the treasure chests too. 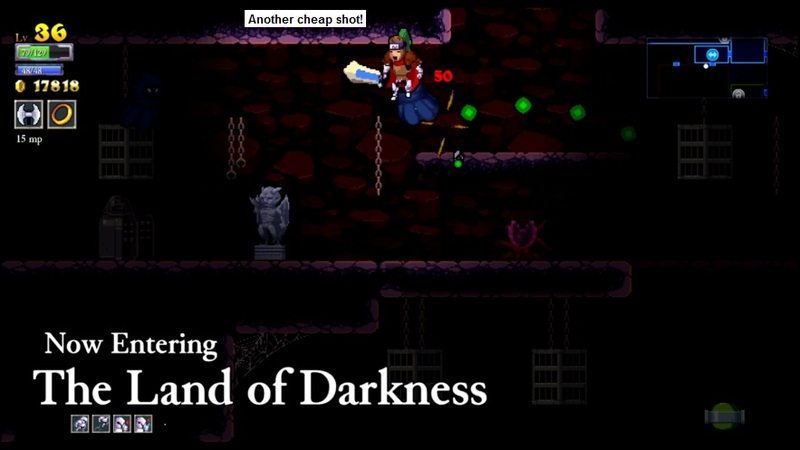 (You press the "Up" arrow to open a treasure chest or enter a door, despite a "Down" arrow icon appearing on the screen. Confusing.) I thought it would be fun to try and defeat Khidr with this handicap. Unfortunately the battle did not go as planned, and I was not able to deal enough damage to defeat the giant eyeball before he killed my character. I simply could not manage to dodge the red goo effectively. There isn't much more to say, Vertigo trait is incredibly hard for me. Feel free to laugh at the run here on YouTube. No traits and the dagger spell, after killing off six poor non-Shinobis in a row. This was Sir Lee 2.0 with the lack of traits and the dagger spell, that's an extremely rare combination. I was hoping that this character would be the first one to get a full dungeon clear (now with a somewhat respectable 165 max health total to work with), and he certainly got off to a strong start. I tracked down Khidr to get my revenge from the last Vertigo ninja, and cut him down without breaking a sweat. One hit taken and it honestly should have been zero. I spent the next part of the journey passing through the tower, getting fairly low at one point when I unwisely tried to get a difficult fairy chest (which I failed), but ultimately having enough lifesteal to keep going without needing to retreat into the castle. Overall it was the smoothest clear of the tower yet, and my Shinobi seemed to have passed the tipping point for the third area. I doubted it would be that much of a threat moving forward. The basement now became the focus for this character, and the first room turned out to be quite challenging. All these recent characters having trouble with the entryways to tough areas! I actually worked my way through several basement rooms in a semicircle and ultimately cleared the entryway from a completely different angle. Progress through the basement after that was safe and steady, with my ninja working his way over to the boss room. That was where I made a critical mistake: intending to use the teleporter, I accidentally walked into the boss room instead. Oh no. That meant a fight against Heredotus, probably the one boss that I could not kill at this point. I gave it my best shot, however I would have needed a perfect battle to come out on top, and this was sadly short of that mark. 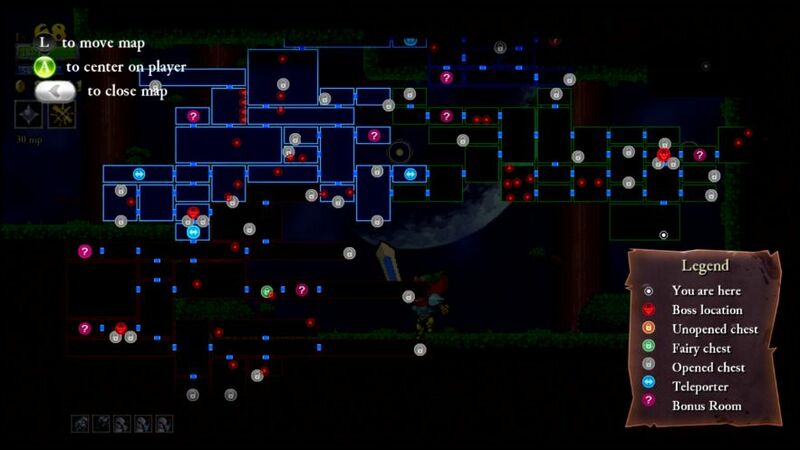 I eliminated about half of the blobs but could not down them all before health ran out. What a waste of a sweet run. I'd have to purchase more upgrades and try again with the next heir. The first thing that I did with the gold from this run was unlock the useful equipment that I'd found along the way, the Sky Chestplate and the Guardian Limbs. This was the first useful limbs gear that I'd found to date (all of the others only increase magic damage, while the Guardian one also boosts armor) and so it required six total equipment upgrades to put both pieces of armor on. My ninjas still weren't wearing a cape either, none of the current options were desirable. The rest of the money was split between the three key stats for all Shinobis: Health, Attack, and Armor. With the utility stuff out of the way, my remaining characters will be leveling up those three stats alongside one another. Hopefully I could power up quickly from this point. Eid. Memory and the conflux spell. Eidetic Memory is a great trait for a lengthy character run, allowing you to see anything that hasn't been killed yet as a red dot on the minimap. This normally means all the bouncing spiked balls left over in rooms that have otherwise already been cleared out. The last few Shinobis had been pushing the boundaries of a full dungeon clear, and this was the one who finally put it all together. I headed for the tower first, and I was surprised at how easy it was to get through there. Monsters were dying in two hits apiece, and the sustain from the Vampire/Balance Runes was enough to mitigate all of the damage taken. I had indeed passed the tipping point for the tower's threat level, passed it and left it in the rearview mirror. The only true challenge was a crowded "defeat all enemies" fairy chest room, otherwise there wasn't much to write home about. One nice aspect of this run was finding Helios' Blessing from a secret shrine, the item that provides more gold from monster drops. I found it halfway through the tower, and that would add up to a lot of extra money over the course of the remaining areas. After the tower was finished I headed down into the basement, where the fighting was tough but not unbearable. My character had to retreat back into the castle twice to recover health, and even that could have been skipped if I'd been willing to eat the teleporter chickens that I found along the way. This time I made no silly mistakes and cleared the whole land of darkness from start to finish. The forest was an anticlimax after that, very easy stuff. It amounted to a hefty gold total and my first full dungeon clear for this class. That left the remaining three bosses. Alexander was a total breeze, his flying skullheads dying in a single melee swing. I was killing them faster than he could breed them, heh. This battle took about fifteen seconds and my ninja was not damaged at all. 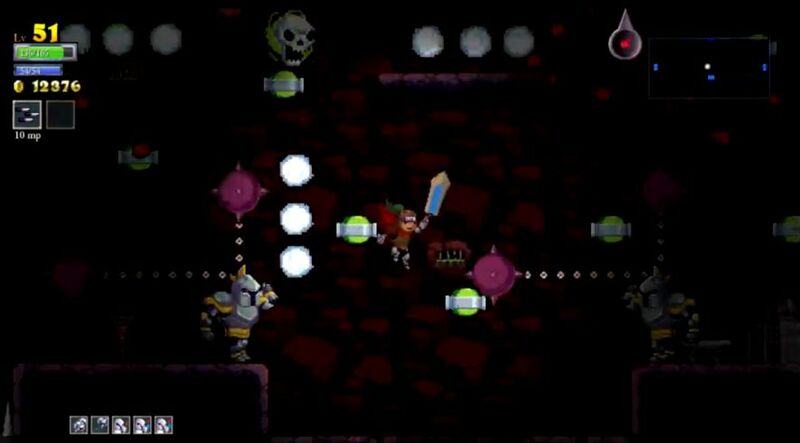 Ponce de Leon was a bit more tricky, largely because the bouncing spiked balls in the chamber spawned in some awkward places. While Ponce himself never hit me, I did take a single blow from one of those spiky balls. That inflicted 40 damage, so I could have taken three more hits without dying. Not really that close. Against Herodotus, I was annoyed to find that my ninja was juuuuuust short of being able to destroy each blob in two hits. I think the blobs literally had 1 HP after two sword swings, but that meant that each one would take 3 hits instead. What a pain, increasing the work needed by 50%! In any case it still wasn't that bad, as I played a solid fight and avoided too many mistakes. My Shinobi's health never dropped below 100 HP, and the +4 life per blob kill helped out significantly. A few minutes of careful fighting was enough to emerge victorious. 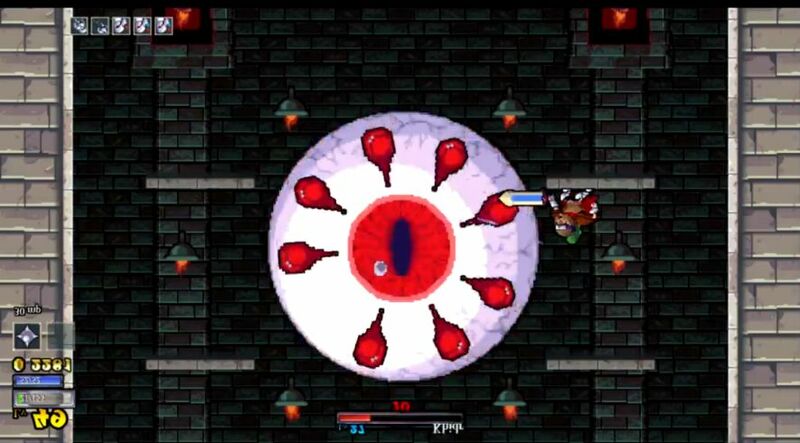 As for the final bosses, I came within an eyelash of defeating Johannes, but he ultimately won the duel. One too many hits from Johannes' own sword in that tussel. Fortunately this lady ninja (or should that be kunoichi?) had brought back 60k gold, and I turned that into a massive haul of upgrades, 32 levels in all. Those extra stats should be enough to finish off Normal difficulty. Tunnel Vision and PAD traits. Getting PAD trait for another character on a long run was very nice indeed. This Shinobi had hugely increased numbers over the last one, health increased from 183 HP to 276 HP, and damage increased from 85 up to 131. Holy cow! (I had way more armor too, which meant that effective health had taken even more of a jump upwards.) I'd have to mess up badly not to achieve another full dungeon clear with so much more overall strength on this guy. Nothing particularly crazy happened, and this ninja cleared the full dungeon again almost effortlessly. I was honestly kind of bored, there was little challenge involved. Everything outside of the basement died in one hit. The good news was that this was another successful run for runes, as I picked up five more runes, including a new Vampire Rune for the Bracers slot. I was disappointed that there were no minibosses in this particular dungeon, and the carnival game had only gold inside the chest after I won. Ah well. It came down to the final boss fights, and neither Johannes nor the Fountain was especially tough. Johannes only hit me a single time, and that was because I forgot to dodge his daggers after blinking away to the other side of the room with the quantum translocater ability. It looked like such a sweet escape... and then the daggers kept coming across the room and hit me. Whoops. The Fountain played a bit coy, using his sword projectile moves over and over again. I was able to dodge a couple of volleys with more use of the shadow clone spell, and otherwise keep smacking him around whenever he was in melee range. It didn't take too long before he was defeated as well. I had well over half my life remaining, and this one was not a nailbiter. It took an even dozen Shinobis to polish off Normal difficulty, and in all honesty it probably should have been fewer than that. Between the poor Vertigo character and some sloppy mistakes that I'd made at times, this group of ninjas could have achieved a full dungeon clear at an earlier point in time. The Shinobis had been entertaining characters to play thus far, and their low health meant that I was never completely safe from danger. A series of mistakes on my part could get anyone killed in rapid order no matter how dominant they seemed on the surface, as demonstrated by the enemy ice mage killing Shinobi #8 above. I expect more of the same on the higher difficulties. We'll see how many more Shinobis it takes to get through the New Game Plus modes.